Backroad Vagrants » Overland Travel Guide » Directions and Information » Overlanding costs analyzed: The cheapest countries! 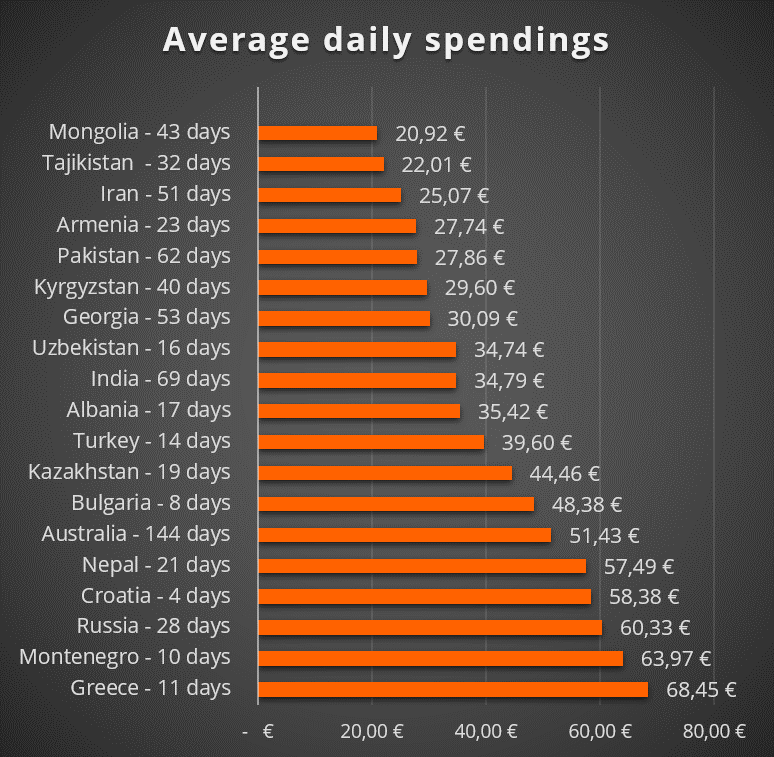 Overlanding costs analyzed: The cheapest countries! In the first part of this post series we have revealed our average daily expenses and on what we usually spend it. 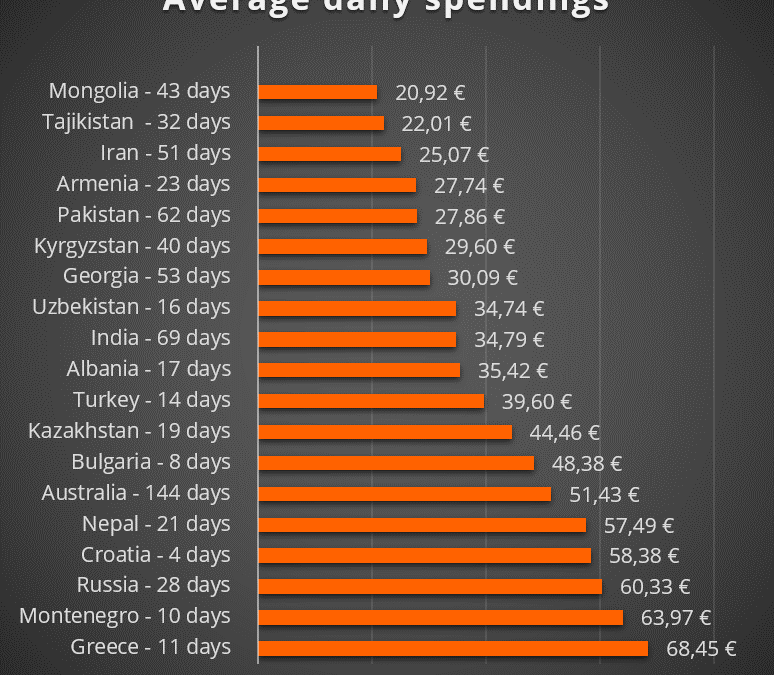 In this post we want to look at our average daily expenses in different countries. Although we did our best in bookkeeping, the following comparison is not entirely fair or true. Especially the expensive end of the list must be treated with caution. Short stays together with a lot of driving (i.e. high costs for diesel) and expensive activities have bumped the price tag on Greece or Montenegro, for example. That is why country specific cost break downs will follow. On the other hand, the top half of the list is very much true for our style of traveling. tthe amount would probably be the same, if you go there again. In our case, these not shown costs make another 27.18 € daily. If you do not need to do expensive repairs, do not fly or ship your vehicle and you leave home with everything you need, this amount can drop to less than 10 € a month of pure vehicle maintenance. So here it is, the full list. Note that we have excluded all the countries in Europe where we just drove through, only stopping for fuel. All prices are daily averages for two people. As we said earlier, there are several factors that influence the price tag on a single country. To get the full picture, please visit our single country spending evaluations, as well! If you have further questions or remarks, please leave a comment. Receive our travel diary and a free full resolution picture with every newsletter! Please note that some of the links on this website are affiliate links. That means that by following the link and buying the product, we will earn a small amount of money. This does not influence the price you pay, nor do we recommend any products we do not really like, just to trick you into buying. Guaranteed! See it as an easy and free way to support us! Join our mailing list to receive our travel diary and a free full resolution picture with every newsletter!